Whether you choose to cruise on Scillonian III or to fly with Skybus, you will be sure to enjoy the natural beauty of the Islands whatever the season... ...exotic plants and wild flowers, ancient cairns and crumbling castles, sparkling white sands and an azure sea - all the treasures of the Islands await you. Only 28 miles from Land's End, yet with a real hint of the Tropics. 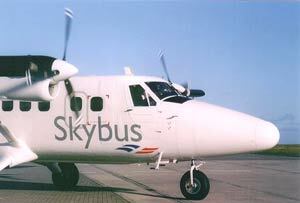 Skybus Fly to the Isles of Scilly on Skybus the Islands' own airline from either Land's End, Newquay, Exeter, Bristol and Southampton Airports. 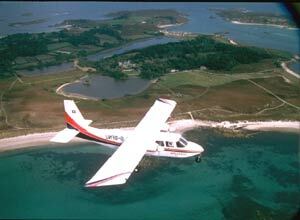 Your flight includes a spectacular view of the Cornish countryside and coastline. On your approach to Scilly you see the Islands, their white sand beaches, the sparkling turquoise sea. 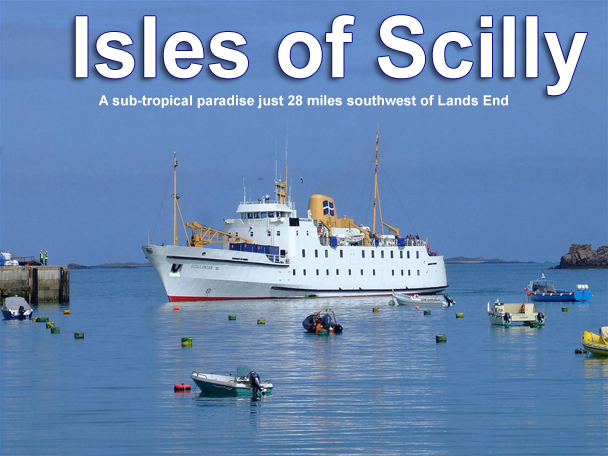 Scillonian III Sail to the Scilly Isles aboard Scillonian III. Departing Penzance Quay, Scillonian III sails past Newlyn, Mousehole, the Minack Theatre, and Wolf Rock Lighthouse. An informative commentary is broadcast during the start of your trip towards Scilly. Your first glimpse of the islands as you approach through Crow Sound or around St. Mary's, is a magical discovery of this wonderful world apart. Probably Britain's best-kept secret. 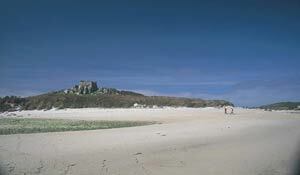 A sub-tropical paradise just 28 miles southwest of Lands End - this has to be the 'perfect holiday' destination. If you are looking for beautiful white beaches, exotic sub-tropical plants and a quality of life that is difficult to find in this busy World, then the Isles of Scilly are your destination of choice. There are five inhabited islands in the archipelago, set amongst hundreds of smaller islands and rocky islets, which provide homes to numerous species of seabirds and marine animals. 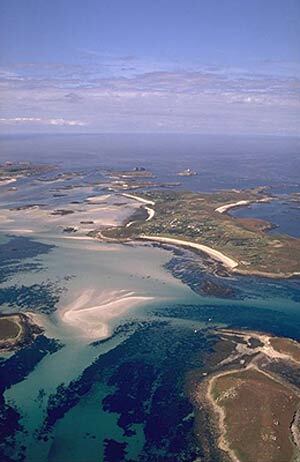 The Isles of Scilly lie squarely in the path of the Gulf Stream, creating a considerable improvement in the climate - surrounded by the Atlantic Ocean and warmed by the North Atlantic Drift - Scilly has a milder climate than the mainland creating a haven for many types of flora and fauna. Migrating birds also rest here during their travels, making this an ideal spot for bird watching. The islands are a place of 'great contrast' - Tresco is perhaps the best example of this dichotomy. The exposed granite outcrops of the northern shores are sculpted by the fierce Atlantic gales during the short winter period, creating a rugged and emotive heather strewn landscape, whilst the Abbey Gardens in the sheltered southern tip of the island is able to support a range of wonderful southern-hemisphere plants. St Martin's - gorse-covered moorland, flower fields and dazzling white beaches, watersports and boat trips to the bird and seal colonies on the Eastern Isles. Bryher - the smallest community of the Islands; wild Hell Bay to the north and the peaceful white sand and wild flowers of Rushy Bay to the south. St. Agnes - the most south-westerly island with secluded sandy coves, a 17th century lighthouse and impressive views across the Western Rocks. 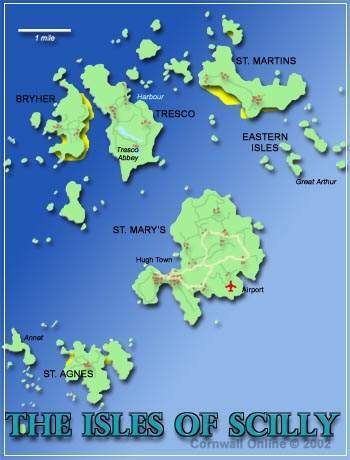 St Mary's - the largest island and forms the economic centre. Here you will find a museum explaining local history, nature trails and country walks, the main shopping area in Hugh Town, a busy harbour and modern small airport. All our ferry and air services arrive here. Regular boat services make travel between the islands easy and enjoyable, with extra trips available if you wish to visit the outer islands, with their populations of seals and seabirds. Fishing and wreck-diving excursions are popular, as is the sport of gig racing which takes place in the 'roads' of water between the islands. Indeed the islands host the World Pilot Gig Championships each year in early May. You can take a day trip for an all too brief glimpse of Island life and take a look at St Mary's attractions or visit an off-island; alternatively stay longer in one of the many excellent guest houses or hotels. Easy to reach Communications with the islands are very good, and getting there is easy. You can travel by sea from Penzance aboard the passenger ferry SCILLONIAN III, or by British International Helicopters - Flying from Penzance - just 20 minutes the beauty and tranquillity of the exotic Isles of Scilly can be yours. From the Heliport at Penzance the Sikorsky helicopter soars majestically across Mounts Bay with its fairytale castle St. Michael's Mount and swings south-west along the breathtaking Cornish coastline. Marvel at the aerial kaleidoscope of beaches, coves and villages along this unforgettable coastline.